The Independent Learning Association (ILA) held its 8th biennial conference on September 5th through 8th at Konan Women’s University in Kobe, Japan. Organizers called for participants to share the voices of all those who collaborate in the process of developing learner autonomy. This review is centered on three questions related to frequently emerging themes from this conference: “Who are we?”, “Where can autonomy be developed?”, and “How can we connect?” Included in this glimpse of the conference are impressions from the author, as well as questions to reflect on for moving the field forward. The 8th biennial Independent Learning Association (ILA) Conference was held from September 5th through 8th at Konan Women’s University in Kobe, Japan. This year’s theme was “Whose Autonomy? Voices and Agency in Language Learning”. The underlying premise of this theme is that language learning is an inherently “dynamic and collaborative” process, achieved by people working together. The three and a half day conference included 140 participants from 14 countries, 60 presentations, 13 posters, pre-conference workshops and symposiums, a SAC tour, and, for the first time, a student conference with 19 high school and university students. Presenters and participants alike offered insights into a variety of valuable perspectives. Although I currently work as a language learning advisor at the host institution, I am still relatively new to learner autonomy. This was my first ILA conference and my first experience giving a formal presentation in this field. I took part in the conference as the student intern coordinator, often checking in and helping them to handle the many small issues that arose while I attended presentations. This review is organized around the following questions: Who are we? Where can autonomy be developed? How can we connect? These questions were addressed, in different ways, within many of the presentations and activities during this conference. 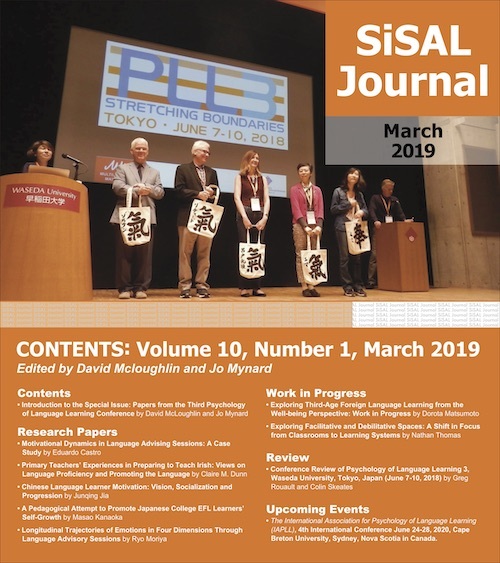 It is my hope that, in addition to being informative, this review may inspire SiSAL readers to consider how these questions apply to their own contexts and experiences. Fitting with the conference theme, many presentations focused on the identities of those who collaborate in the development of autonomy. The following presenters discussed in detail some of the ways in which learning advisors and teachers, individuals embedded in societies, and language learners view themselves and their roles. Chika Hayashi of Seikei University (Tokyo) and Leena Karlsson of the University of Helsinki delivered a joint plenary: “A collaborative reflection on our journeys with learners’ voices”. They presented a “collective biography” tracing their experiences as educators and explaining, despite contextual differences, the many ways in which their “[journeys] meet”. This included sharing “critical episodes” in their lives that transformed them and how they influenced and were influenced by their own teachers, colleagues, and students. While having different professional backgrounds, with Karlsson working as a language counselor (synonymous with advisor in this context) and Hayashi as a classroom-based teacher, both believe that engaging in dialogue, including written dialogue, with others can be a mutually empowering act that expresses autonomy. Learners and counselors alike are on “parallel journeys”. The plenary speakers see affect, including feelings on language learning, as a powerful resource when communicating with learners. The sometimes negative emotions that are part of language learning should be faced directly, a process that can be beneficial for learners. Hayashi and Karlsson also shared their current practices and research. Hayashi is practicing collaborative dialogue with learners with the goal of creating a learning community in the classroom based on joint reflection; a way for learners and teachers alike to “find autonomous paths together”. Karlsson is focused on transformative learning through reflective and expressive writing. This honest and engaging presentation, made more impressive by the fact that Karlsson and Hayashi live on opposite sides of the globe and had not met in person until just a day before the conference, provided useful insight for advisors and teachers who are interested in building relationships with learners that promote autonomy and empower. It was also an important argument for the significance of affect in the language learning process and the value in reflecting on emotions, both good and bad. Maria Giovanna Tassinari (Freie Universität, Berlin) focused more specifically on the experiences of language learning advisors. She presented “Language advisors’ self-perception: exploring a new role through narratives”. The language advisor position, relatively new, can be carried out in different ways in a variety of locations, making it a somewhat difficult to define role. Tassinari collected written narratives to better understand how advisors perceive themselves and how this affects things from their teaching roles to their private lives. These narratives came from language advisors in higher education institutions, representing a variety of ages and nationalities. Tassinari provided some excerpts from advisors’ writing, featuring their “core understanding[s] of language advising”, their development and histories as advisors, and their opinions on the relationship between advising and teaching. Though the advisors defined their roles differently, had different perspectives and concerns, and even expressed different relationships with autonomy, all of the narratives included the following: encounters with mentors and colleagues that had a personal or professional impact and the desire not only for more chances to engage in networking with fellow advisors, but more recognition for their roles. This presentation included a call to create a better network of advisors across borders (both institutional and national) for effort to be made towards spreading awareness about who advisors are, what they do, and their value. Tassinari’s research adds to the recently growing body of work on advisors, including professional development and how they reflect on their dialogues with learners and colleagues. Hopefully, this will lead to greater understanding of this field and even more effective support and training for advisors. James P. Lantolf (The Pennsylvania State University, Xi’an JiaoTong University), delivering one of the conference’s plenary talks via Skype after typhoon-related travel cancellations, presented “Hearing voices: Collectividuals and agency in language classrooms”. In this presentation Lantolf looked at learner autonomy, or agency, a “virtually synonymous” term, through a sociocultural theory-based lens. Lantolf explained that people are not truly individual, but may be more accurately described as “collectividuals” who live in societies that influence them and are shaped by them. Human agency is collective agency, thus, according to Lantolf, “not completely autonomous”. Agency cannot be teased apart from the culture it functions through. Lantolf discussed the cultural mediation of human development. People have agency, but it is constrained “by the culture we are mediated into”, therefore “agency is dialectic of constrained freedom”. Lantolf also discussed education as a “mediated activity”, supported by mediators, or teachers. Similar to learning a first language, we cannot “learn things alone”. This presentation provided an interesting look into the ways in which agency functions through culture and reiterated that learning is an inherently social activity. The concept of “collectividuals” aligns with the research within the self-access learning field on community, interaction, and the “ecology” of spaces such as self-access centers and other environments that promote autonomy. The views of learners and how they change as they interact with peers from different cultural backgrounds were the focus of Maria de la Paz Adelia Peña Clavel’s (National Autonomous University of Mexico) “Telecollaboration: autonomy and identity in a self-access centre.” Students at her institution take part in “teletandem” which allows them to engage with peers abroad in collaborative language learning via video chat. Teletandem learners at UNAM wrote in diaries after their chat sessions. Peña Clavel analyzed these diaries, wondering if learners could “develop [autonomy] via tech mediated communication”. When asked what teletandem meant to them, learners shared that they felt it allowed them to share their culture, make mistakes, and learn to identify their own language learning needs and strategize, thus developing their agency. Some learners also found that their personalities shifted: they become more tolerant of others and softened some culture-based beliefs and boundaries. Peña Clavel explained that the communicative space created through teletandem is a sort of ecosystem in which learners define their identities “by and with each other”. Peña Clavel seeks to look more deeply into how using teletandem may shape one’s identity as an autonomous learner and the impact that belonging to this sort of learning community may have. This presentation’s significance lies not only in its exploration of how learner identities shift; it challenges the boundaries of where learner development can take place. Where Can Autonomy be Developed? Presentations in this conference looked not only into the ways in which language learners and facilitators develop autonomy, but the spaces in which these activities take place. These include physical spaces, such as classrooms or self-access learning centers, as well as, increasingly, virtual spaces. Yoshio Nakai of Doshisha University (Kyoto), presented the experience of one Japanese language learner, “Eva”, from Hong Kong. Eva, inspired by a friend, began to use the Japanese video sharing website “Nico Nico Douga” (ニコニコ動画) as part of her studies. On this platform users can upload videos or live stream themselves doing activities such as playing video games. After starting to learn Japanese in Hong Kong she became an international student in Taiwan. She then began to live stream herself playing video games while narrating in Japanese, receiving comments and feedback directly from Japanese users on her pronunciation and intonation. Nico Nico Douga, as Nakai argued, can serve as a “virtual SALC” where a learner can construct their “ideal L2 self” through social interaction. Later Eva came to Japan as an international student to study Japanese. Influenced by her experiences there, including formal language education and feedback from teachers, her “ought-to” self evolved into someone who “[needs] to use proper grammar and vocabulary”. Through looking at Eva’s experience, Nakai further explores the boundaries and possibilities of learning spaces. Platforms like Nico Nico Douga, while unconventional, are virtual spaces than can fulfill the needs of autonomous learners, including offering opportunities to explore social identity and a community and sense of belonging. This study illustrates, as one participant commented, the “importance of human relationships”, even those that may be anonymous. It was particularly interesting to see how a learner transitioned from a virtual community to a classroom context and how these different spaces shaped her identity and goals. Jo Mynard of Kanda University of International Studies, Japan delivered one of the conference plenary talks on “Supporting learners through dialogue within and beyond the classroom”. Mynard stressed that educators need to “expand” their understanding of how and where learning takes place. The binary thinking of learning as taking place either inside or outside of the classroom is “no longer [useful]” as learning can take place in a variety of contexts. Learning “beyond the classroom” should be both self-directed and autonomous. Self-access centers, Mynard explained, can be places where both are encouraged, serving as “resource centers, places to practice using the target language, for listeners to get support, for organic social learning communities to form, places with opportunities for ownership and leadership, places for learners to develop their passions and interests, and centers for research and hubs for professional development.” Mynard presented “snapshots” of four self-directed learners in the self-access center at her institution, showing some of the real ways in which students become more autonomous. Not all learners may be ready for learning beyond the classroom and may require guidance that could be facilitated by creating a conducive environment, connecting it to classwork, or language learning advising. Mynard then discussed advising strategies, and the various modes of advising. Learner beliefs must be challenged to help them learn how to start becoming more self-directed or, if they already have autonomous habits, to take the next step. Mynard expressed the need for more research showing the effectiveness of advising in language learning. She encouraged the recording, analyzing, sharing of advising sessions with the hope of building a corpus and making language advising a more widely accepted mainstream practice. The Research Institute for Learner Autonomy Education (RILAE), established in 2017 at Kanda University of International Studies was established with this goal in mind. Though many points in Mynard’s plenary are quite familiar to those working in a self-access environment or as language learning advisors, the clear, concise, and passionate review of current concepts in self-access learning and language learning advising, in addition to the sharing of real student experiences and the call for more research and sharing of advising data are invaluable. Echoing Jo Mynard’s plenary speech, many conference participants expressed the desire for more sharing and collaboration among those involved in self-access learning. In response to this need the conference included activities and symposiums organized to enable discussions and platforms for students to share their perspectives on learning and get involved in the conference itself. Before the conference began, the Japan Association for Self-Access Learning (JASAL) organized a self-access learning center tour that attracted 27 participants. Three nearby SACs in Kobe were toured: Konan University’s “O-Zone” (Nishinomiya “CUBE” Campus), Konan University’s “Language LOFT” (Okamoto campus), and Konan Women’s University’s “e-space”. This tour offered participants the chance to hear directly from SAC advisors and administrators about how their spaces are developed and managed, the resources available to learners, and some of the successes and challenges they have experienced. Participants were very engaged, doing things like taking pictures of event promotions, noting materials such as games and books, and looking closely at guides to SAC use for learners. These exchanges are beneficial for those involved in self-access learning at their own institutions and a great way to introduce SACs and what they can offer learners to those who may not yet be familiar with them. Later during the conference JASAL committee members held a two-hour symposium. The first half of the symposium consisted of discussions. Participants suggested topics they were interested in and separated into groups. Topics included SAC usage, connections between curricula and SACs, language learning advising, self-access research, and student staff. Conversations were active and fruitful, benefitting from the structure of the discussion, which allowed all participants to write their questions and concerns, write feedback for others, chat, and share salient points with the larger group. The second half of the symposium featured a panel discussion including Kerstin Dofs (Ara Institute of Canterbury, New Zealand), Maria de la Paz Adelia Peña Clavel, and Maria Giovanna Tassinari. Participants asked questions that created a lively dialogue; topics including self-access center language policies, defining differences between counseling, advising, and teaching, using learner portfolios, and what the panelists’ ideal research topics would be. The discussion closed with an agreement among panelists on the need for more collaboration between SACs and sharing of self-access related research. This conference served as a forum not only for educators and advisors, but learners to share their perspectives and connect with each other. ILA featured a student conference for the first time, including learners from high schools and universities in the region. Students represented different backgrounds and language ability levels. 19 students shared their personal language learning experiences and strategies, presenting posters, asking questions, and taking part in dialogue, in English, for over two hours. At the end of this session all students delivered brief reports on their presentations to an audience of conference participants. This conference was also beneficial for the 26 student interns that helped by keeping time, giving directions, registering participants, serving refreshments, and answering questions. Student interns reported that helping with the ILA conference had a positive impact on them. Encounters with international participants, opportunities to use their English skills, seeing researchers’ passion through presentations, and feeling genuine interest and support from conference participants were particularly motivating according to intern reflections. Academic conferences can and should be occasions that embrace learners and provide a platform for them. ILA sets a great example that I hope future conferences will maintain. It feels appropriate to end this review reflecting on connections. The essential relationships between many of those involved in aspects of language learning and moving towards autonomy were presented, deepening understandings of self-access learning. Participants (re)connected in the friendly and comfortable atmosphere during busy conference days and evening social events planned by the conference conveners: Steve Brown, Ann Mayeda, and Hisako Yamashita of Konan Women’s University. Presentations and discussions showed how multi-faceted the world of self-access learning truly is: involving people with many different roles, in different spaces, interacting with and developing alongside one another. Hopefully this serves as an impetus to keep listening to the voices we hear while working with learners and make efforts to seek those that we do not. We should also strive to share more of our research, our strategies, and our perspectives on self-access learning, within and beyond our institutions, and make sure that learners, too, are involved in these practices. Elizabeth Schlingman is a learning advisor in Konan Women’s University’s self-access learning center “e-space” in Kobe, Japan. She has an MA in TESOL from the University of Findlay (Ohio, U.S.). Her current research interests include reflective writing and dialogue, student staff development, affect, and strategies for increasing self-access learning center use.